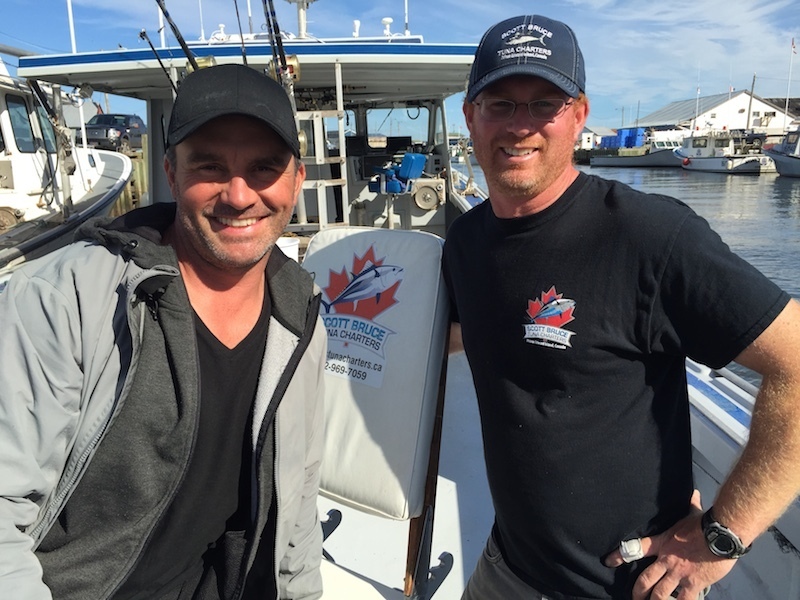 In the fall of 2016, I had the great pleasure of hosting Cyril Chauquet and the crew from his popular TV show, Chasing Monsters (Mordu de la Pêche) aboard my boat in North Lake Harbour, PEI. They joined me to film a bluefin tuna fishing trip for an upcoming episode of the travel fishing series. Many of you are already fans of Cyril Chauquet but for those who are not familiar with this sport fishing enthusiast, Mr. Chauquet travels the globe in search of the most monstrous and challenging species of fish. When I first met Cyril I knew we would get along – his passion for fishing rivals my own! Cyril Chauquet and I aboard my boat in North Lake Harbour, PEI. The episode we will be featured in will start airing within the next few months. When I get an exact date I will be sure to update you all. I wish I could let you in on all the details of our trip but I don’t want to spoil it for you. Trust me though, when I say it was action packed and the crew got incredible footage! I can’t wait to see it myself! Cyril Chauquet’s show is aired in dozens of countries around the world. The english version is known as Chasing Monsters and can be found on channels such as Animal Planet, Discovery Channel, Netflix, A & E, Spike, BBC World, History Channel and Travel & Escape. The french version of the show is called Mordu de la Pêche. Be sure to check your local TV listings. As with every fishing charter, finding giant bluefin tuna for our clients is always a thrill. We love bringing you to the fish and watching you fight and reel in the big one! It’s a sight that never gets old. Cyril Chauquet was no exception. Not only did we get to spend the day doing what we love to do but we got to film the entire experience with him. It’s going to be pretty cool reliving the day when Chasing Monsters, Mordu de la Pêche airs. Below is another picture of me and Cyril Chauquet. 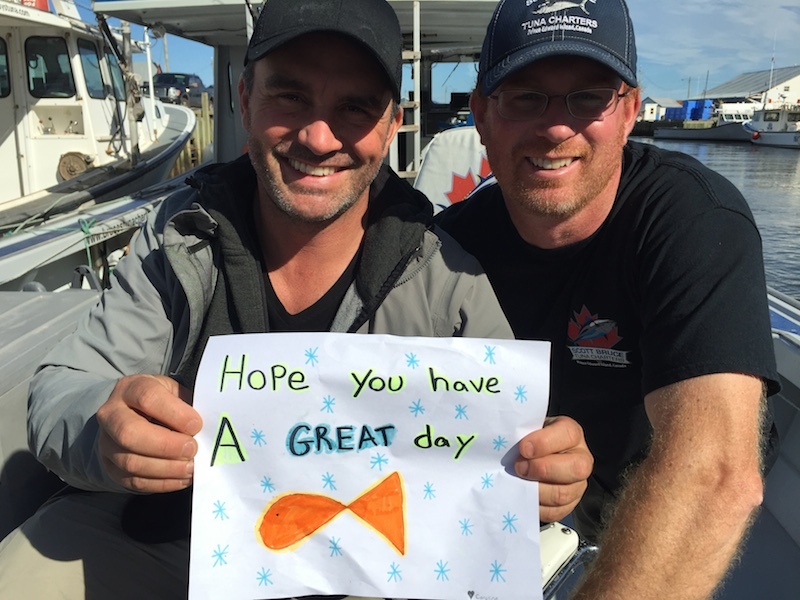 Sometimes my daughter Caroline, likes to brighten my day and surprises me with notes or pictures on the counter at home the mornings I go fishing. Mr. Chauquet was nice enough to pose with her drawing as a little surprise for her! Cyril Chauquet holding my daughter Caroline’s drawing.